The terrorism spotlight fell on Holloway this week as three people in their 20s were linked to al-Qaeda in Syria. 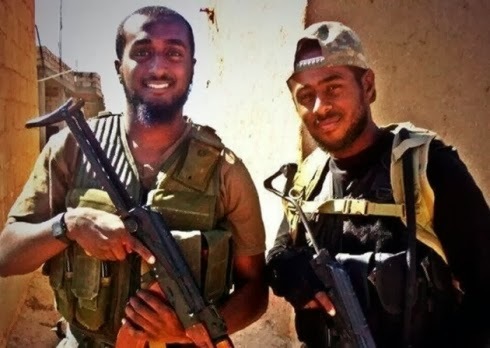 Propaganda images were ­released on social media of brothers Akram, 24, and Mohamed ­Sebah, 28, who grew up in Cornwallis Square, and are believed to have died in battle in the war-torn country in September. The two were pictured together smiling and brandishing guns in camouflage gear and were hailed “martyrs” and “young British ­lions” in messages sent out to ­encourage other recruits to follow in their footsteps. Neighbours believed they had died in a car accident in America. The news followed the court ­appearance of Naval Masaad, 26, of Centurian Close, who is alleged to have tried to smuggle £16,500 in her knickers to terrorists, also in Syria. She and her suspected accomplice Amal El-Wahabi, 27, of Rucklidge Avenue, Willesden, are thought to be the first British women to be charged with terror offences over the conflict…. Yes, there is much more here. A new study on North Africa and the Sahel reports that terrorist attacks in the region “increased an alarming 60 percent” in 2013, to the highest annual level over the past twelve years. “An expanding array of al-Qaeda-affiliated and like-minded extremist groups” escalated their violent attacks across an “‘arc of instability’ from the Atlantic to the Red Sea.” These extremist groups include several al-Qaeda-affiliated and like-minded extremist formations and their associates, such as Al-Qaeda in the Islamic Maghreb (AQIM), Boko Haram, Ansaru, Ansar Dine, Ansar Al-Sharia, the Movement for Oneness and Jihad in West Africa (MUJAO), al-Mourabitoun, the National Movement for the Liberation of Azawad (MLNA), Al-Shabaab, and militant recruits from the Polisario-run refugee camps and other displaced persons. The study, Terrorism in North Africa and the Sahel in 2013, reports that Libya, Algeria, Mali, and Tunisia suffered the highest rate of attacks in the region, which has seen terrorism rise more than 600 percent since the 9/11 attacks. The study, authored by Yonah Alexander, director of the Inter-University Center on Terrorism Studies (IUCTS) , is the IUCTS’s fifth annual report on terrorism in the Maghreb and Sahel region. It was released last Friday at the National Press Club in Washington, D.C. at the 16th annual event on International Cooperation in Combatting Terrorism: Review of 2013 and Outlook for 2014, hosted by the IUCTS/Potomac Institute for Policy Studies. It is my absolute belief that… “The stakes are too high…” for ANY of us to disengage from the global threat of terrorism. What happens ‘over there’ DOES affect us all ‘over here’ and should concern us all.